I’ve been to Naples, FL quite a few times but never made it to Artis – a museum and performing arts center. They have a fabulous exhibit there right now, in fact two of them. Costumes (even the jewelry) made from paper by Isabelle de Borchgrave , and sculptures by Philip Haas. Every bit of these costumes, jewelry included, is made out of paper. They are fabulous! I was impressed with the size of the show too, it filled 4 of their galleries. About her, her work and “this exhibit, which was Co-organized by the Frick in collaboration with four other American museums, this major exhibition presents the full breadth of de Borchgrave’s exploration of historical costume through contemporary paper sculpture. If you’ve never seen the artist’s work, you will be delighted by these breathtaking, life-size renditions of historic clothing created completely from artfully painted, pleated, crumpled, and manipulated paper. From replicas of Renaissance Italian gowns to recreations of the fantastical modernist costumes of the Ballet Russes, Isabelle de Borchgrave’s work is meticulously crafted and astonishingly beautiful. 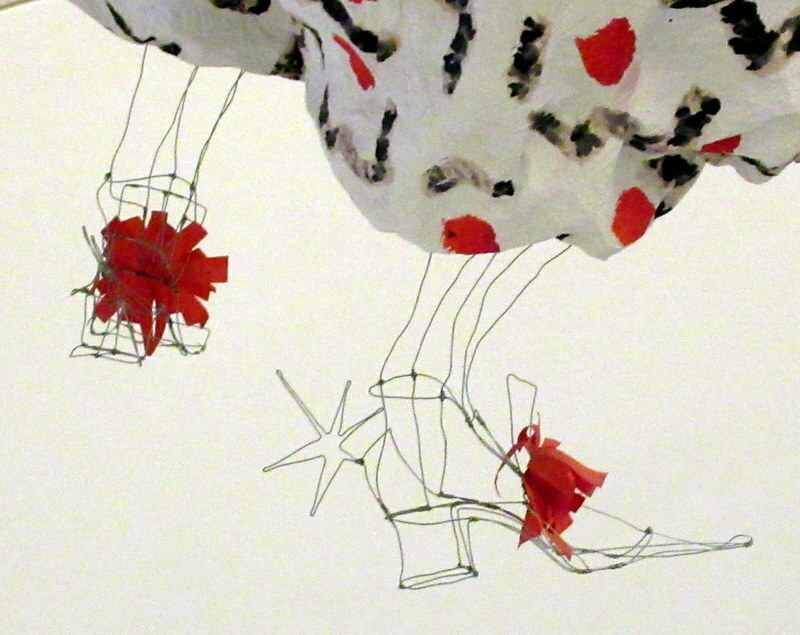 The artist’s interest in creating paper costumes was sparked by a visit to the Metropolitan Museum of Art in 1994, where she found herself inspired by the historic costumes on display. Back in her studio, she began to experiment with creating renditions of the pieces in paper. Since then, de Borchgrave’s paper costumes have been featured in major exhibitions around the world. There are costumes fashioned in paper from paintings I was fortunate to see in the Uffizi Gallery in Florence, Italy last year. I was “taken” by the entire exhibit, everyone knows I’m not a fashionista, but I was enthralled by the artistry of the crumpled, painted paper! The piece above was commissioned by the Frick to depict the costume in a painting from their collection Peter Paul Rubens’ Portrait of Charlotte- Marguerite de Montmorency, Princess of Condé. In addition to making clothing made of paper she is also a painter. The artist was born in Brussels, Belgium in 1946, is a countess, and her work has been shown worldwide, if you get a chance to see it don’t miss it. They also have about a dozen sculptures by American artist Philip Haas. These outdoor pieces are about 15 feet tall and made from fiberglass. His sculptures are inspired by the works of Giuseppe Arcimboldo, and Philip is also a film maker. Both exhibits are worth seeing! The fact that you are such an amazing seamstress I know you would have loved it. She even made feathers and lace that looked so read. Wish I was going to Belize with you!